As a gold maker you will likely hit a point where actually fitting all your items in your bags is a problem. Moving items between the bank and your bags manually is painfully slow. 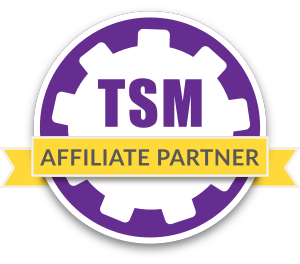 Thankfully TSM has us covered with warehousing operations to quickly accomplish this. As with all the other cool things you can do with TSM warehousing is controlled by operations. Warehousing operations actually have a fair number of settings, but they are quite straight forward to understand. Before we look at the operation we will look at the UI to use the operations though. Below you can see the TSM Banking UI. It should look fairly familiar as it contains a list of all your groups with warehousing operations applied and some buttons to trigger your operations. For banking there are a lot more buttons than on the other parts of the TSM UI however. Move to bank and move to bags will move the items in the group according to the move rules in your operation. Restock bags will restock items to your bags according to the rules defined under Restock Settings on your operation. Deposit reagents will deposit all your reagents to the bank. Empty Bags will clean out your bags, and restore bags will restore them. The warehousing operation will govern the buttons “Move To …” and “Restock Bags”. If we look at the full settings for an operation you can see it below. 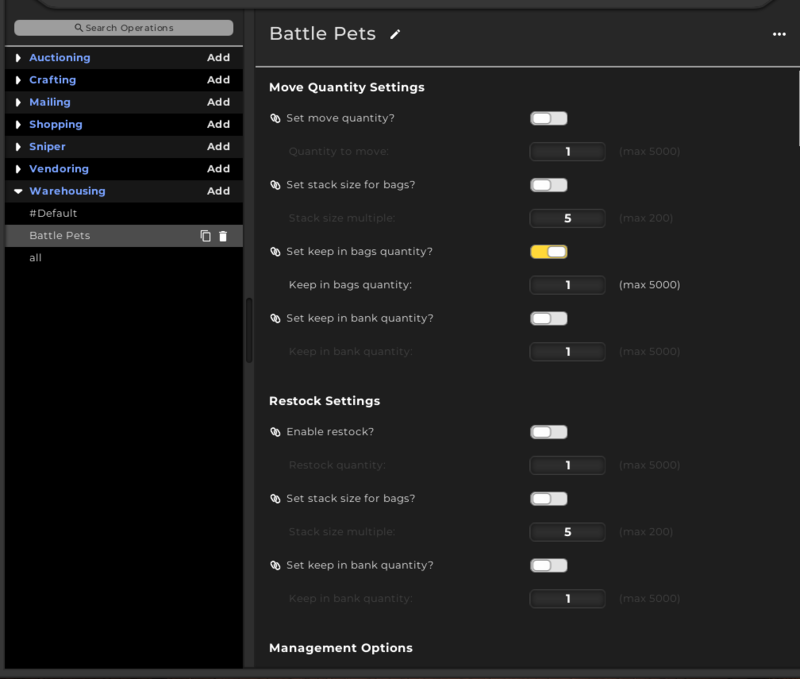 We will go through the move quantity and restock functionality separately though. Set Move quantity will set the number of items that are moved. If this isn’t checked it will move all the items unless any of the “Keep in bank” or “Keep in Bags” settings are activated. This just sets the number of items you move per click of “Move to Bank” or “Move to Bags”. The next setting is the stack size for bags. This will move the items in a specified stack size in your bags. If you don’t set it it will just move the items as they are. This will usually not be particularly useful, but if you prefer a certain stack size it can be good. The two last settings are Keep in Bank and Keep in bags. They can be activated to set a minimum amount to keep in your bags or your bank when moving items. If keep in bags is set to 1 and everything else is unchecked it will move everything except one of each to your bank. 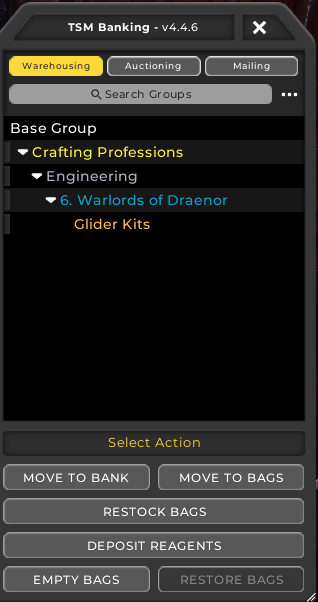 This is great for crafted armor for instance, where you just want to post one of each item to the AH. The restock settings share 2 settings with the Move Quantity box. Restocking will only move items from your bank to your bags. The idea behind this is that you have a lot of items in your bank, and you want to restock your inventory with whatever you are posting to the AH. Maybe you will be posting 200 Eternal fires and your bank has 1000, so you set a restock for 200 to quickly fill your inventory with exactly what you need. 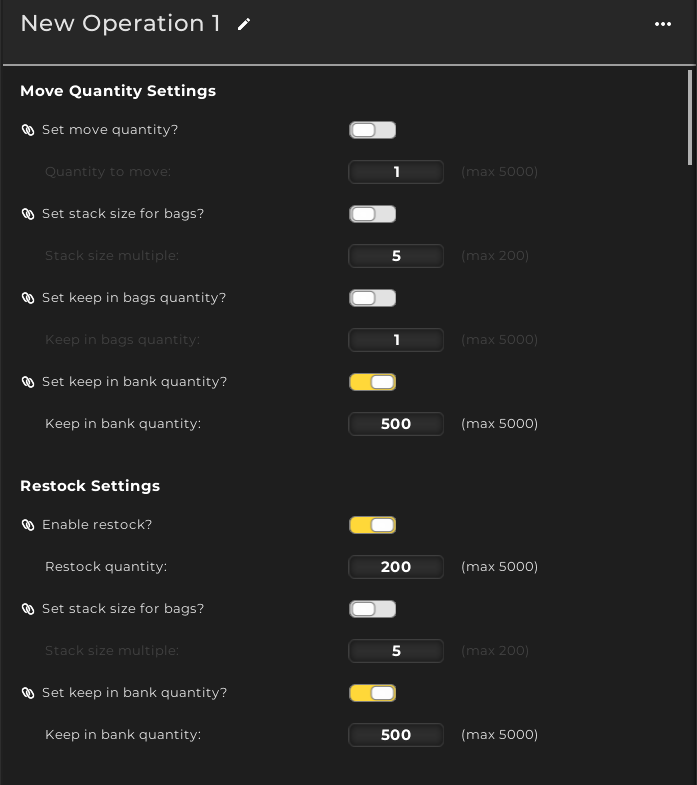 The Enable Restock check box will activate restocking and allow you to set the quantity you want to restock your inventory to. The last two settings are used to set a specific stack size in your bags and to set a minimum level in your bank with the keep in bank quantity. 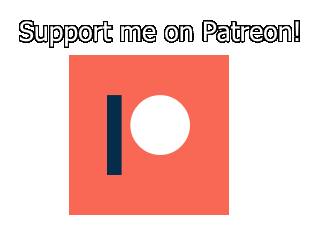 To show you how you can use this I will give you a couple of examples. This is a very simple warehousing operation that will move everything from the bags to the bank or the other way. It is useful to quickly clean your bags or bank for a group. It can also be used for initially filling your bank and then you add restocking settings to fill your inventory as needed. To make this operation you will just uncheck all the check boxes on the operation settings. This is literally the default if you make a new operation so it is quite quick! This is an operation that will fill your inventory with 1 of each item in the related group. This is great for transmog, armor, battle pets and any other market where items take one slot each and are only sold in stacks of 1. It is of course mostly just useful if you have duplicates stored in your bank, but it is quite great. To do it you will check Keep in Bags under the move settings and keep 1 in your bags. This will allow you to quickly move your duplicates to the bank. 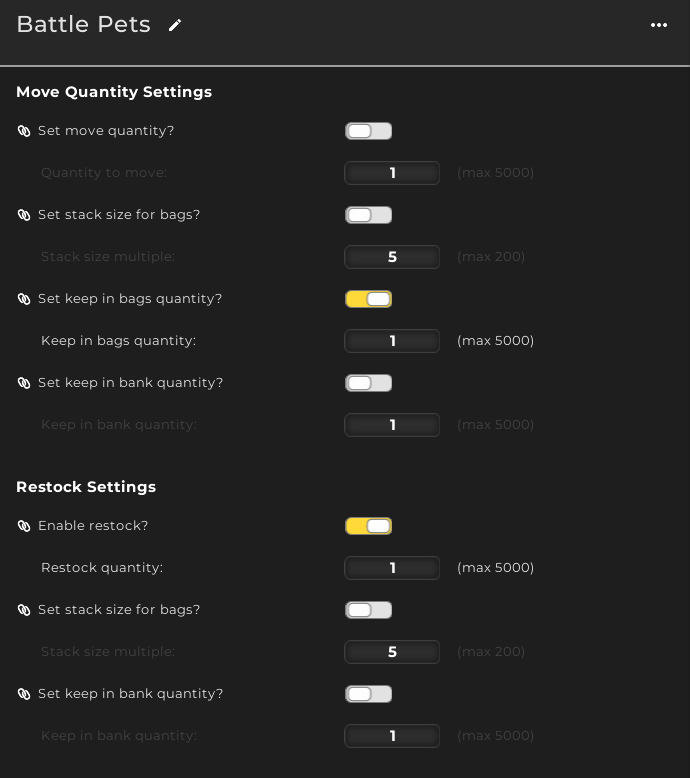 Then under restock you enable Restocking and set the quantity to 1. An argument could be made to remove the keep in bags if you want to add any unposted items back to your bank. This setting is useful for a material market. We will move 200 items to our inventory to post on the auction house. We will also enable keep in bank, as this could be used for a material you use both for crafting and to sell. So you want to keep a minimum of 500 of it in your bank at any time to avoid running out. To do that you would enable the settings as in the screenshot below. We let the move quantity be all of it so you can quickly move the items into your bank. You could set the keep in bags quantity to 200 if you want to not run out, but it is more efficient to move everything to bank and then restock across all your groups. We did not touch the stack size as we do not care about it at all. I am not sure what I did in my settings, but I no longer have a TSM screen that opens when I click on the banker. I don’t see a tab for TSM either. Can you tell me how to get that TSM Banking screen? Hey, that sounds like it’s been disabled for some reason. There should always be a TSM tab in the bottom right of the AH UI. If you type in /tsm bankui it will reopen for you.